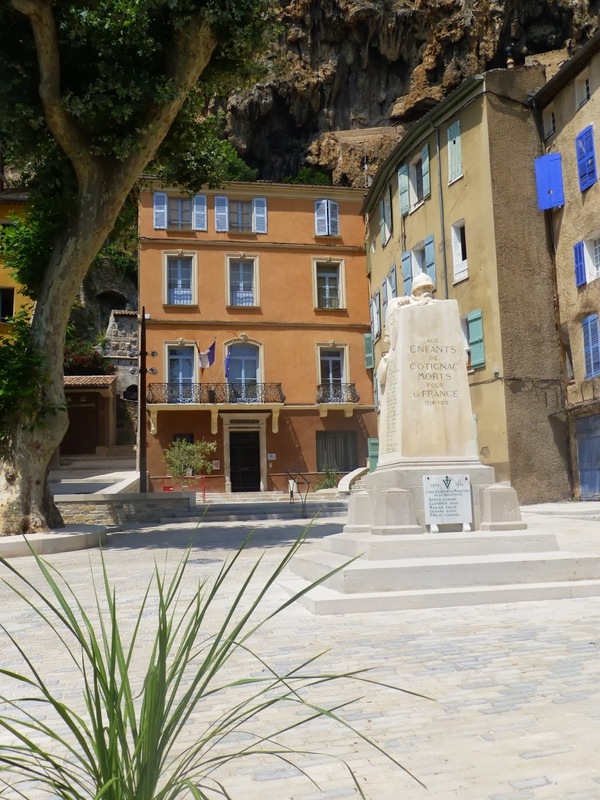 Hotel de Ville – our house is to the left. Runners at the end of the race: note wine bottles! 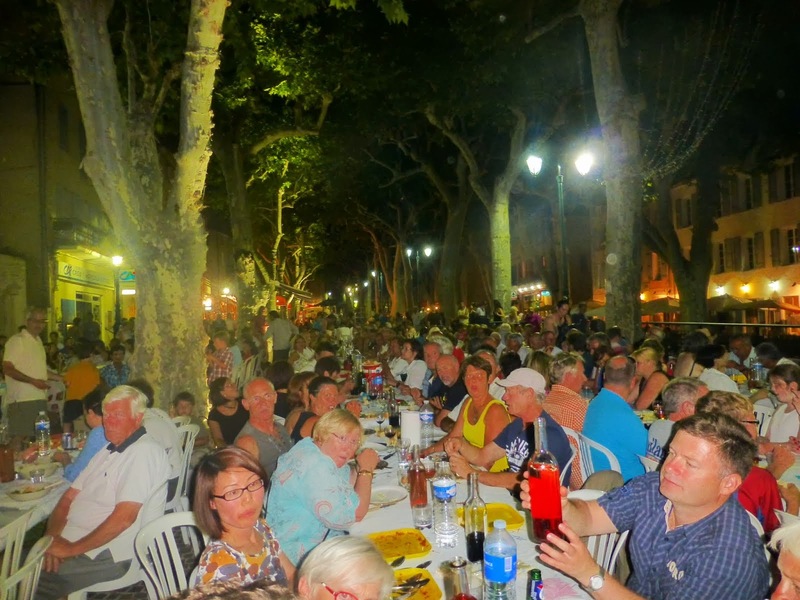 We left Lerici around 8.30 and made it to Cotignac in Provence around 3pm just before the village roads closed for the Bastille Day fun run and then evening celebrations. The Brannock’s house is just as lovely as I remember and we have the big guest bedroom and its fantastic. Overlooks the Place de Marie and Hotel de Ville. We went straight to one of the bars to watch the Tour de France. Around 7 we went back to the village to watch the fun runners come in and they were very sweaty looking. It was a little different to our fun runs. 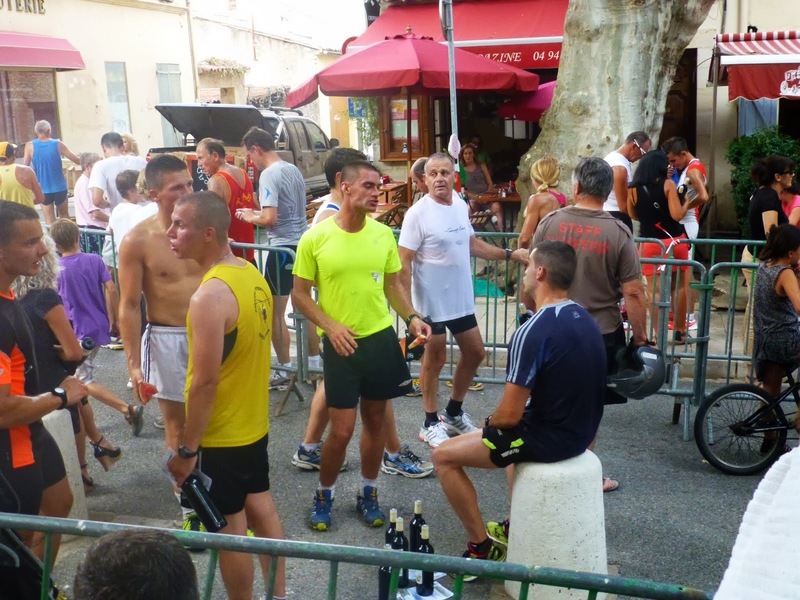 It ended through a narrow passage so they had to pass the wine table where every runner received a bottle of red wine. Then it was off to the food table. No oranges and water for these runners! They had coke, wine, juice, watermelon, gingerbread slices, butter cake, cherries – and of course a second glass of wine if needed. They stood around after the race patting each other on the back and toasting their success. The singing if the French National Anthem was stirring and the fireworks stupendous! There were no obvious safety precautions or barriers between the crowd and the fireworks . They were just slightly out of alignment and the ones shooting left were hitting the eaves of the nearby house and it nearly caught alight! It was all very French and we loved it. John sprinted off the greet some others fiends arriving to stay and then we arrived home after midnight (the party was really only just starting) to find poor John on the bed with an icepack. He had strained something in his leg and was in quite a lot of pain. Off to bed in a very comfortable bed but not before Steve had broken 3 glasses and a plate! It was an accident but don’t ask how. Hope we get invited back.